What a lovely word – “diatomaceous”. It’s one of those words that roll off the tongue once you know how to pronounce it. But what the heck is it? Diatomaceous earth (DE) is a naturally-occurring silica compound made from the fossilized, skeletal remains of diatoms – minuscule aquatic organisms. Oh….I can hear you telling me “That sounds disgusting!” But wait….just hear me out!It’s found in the sediment of rivers, streams, lakes, and the sea – which means it is completely natural. DE has many practical applications in the home. It will kill insects and mites in the home, in the garden, and on your pets. 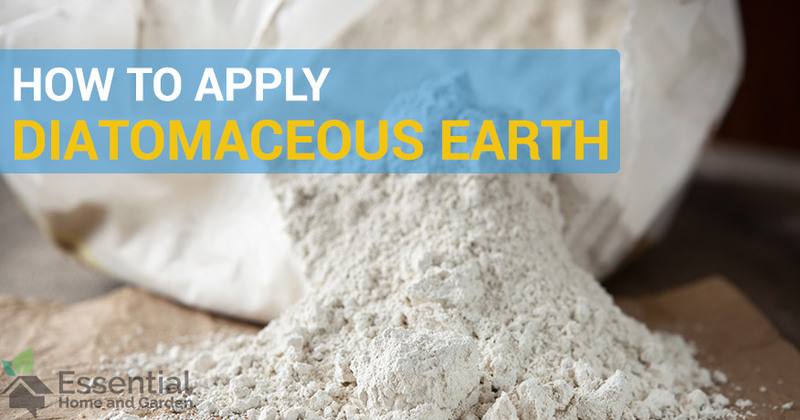 Let’s learn a bit more and take a look at how to apply diatomaceous earth. Are there any side-effects to using diatomaceous earth? Products containing diatomaceous earth can be bought in most hardware stores; most commonly as a dust, but can also be found in other mediums, such as wettable powders and diatomaceous earth spray. These products can kill bed bugs, fleas, crickets, cockroaches, ticks, and spiders, as well as many other household pests. Additionally, diatomaceous earth can be found in skin care products; toothpastes and foodstuffs; medicines; rubber products; paints; and water filters. Diatomaceous earth is non-toxic to humans or pets. When pests eat it, they dehydrate and die – the DE absorbs the fats and oils from the insect’s exoskeleton. Although the powder is non-toxic, it might be accidentally inhaled when laying it out for pests. This isn’t hazardous but could irritate the nasal passages. If you inhale large amounts, it is likely to make you cough, and you may experience shortness of breath. It can irritate sensitive skin. The powder is abrasive and can irritate the eyes. Luckily, there are no harmful effects on wildlife when laying DE for pests. It is recommended, however, to keep it away from chickens. DE can be dehydrating, so it’s worth wearing gloves when handling – it can dry out the skin. Although DE is non-toxic, it’s best to avoid inhaling it. Wear a mask when sprinkling. Food-grade DE is recommended for home use. It should also be noted that DE is a challenge for a domestic vacuum cleaner and will block the filter quickly. Make sure that you clean the filter regularly when cleaning up to avoid damaging the motor. Bed bugs can affect any home – they live in warm locations, and are particularly fond of our beds, clothes, carpets, and furniture. The human body is a constant source of food for bed bugs, so they can be real pests in the home. Luckily, DE is the chemical-free, effective method of eradicating bed bugs from the home. It’s safe to apply all around the house, and safe around pets and children. DE only affects adult bed bugs, so this is no immediate fix – you’ll need to leave it for a couple of weeks to break the life-cycle. For more natural ways to get rid of bed bugs see this article. Temperatures in excess of 130ºF will kill bed bugs after a few hours. Wash fabrics in very hot, or very cold water. If you can tumble-dry on high heat (without damaging the linen), then all the better. Store the washed fabrics in sealed containers or plastic bags. Thoroughly vacuum your carpets, using a carpet cleaner if possible. If you can dismantle your furniture, then pay attention to seams and frames. Use the hose attachment to get into tight spots. Using an applicator, apply DE to areas where you suspect the nasty critters are hanging out. Focus along moldings; in drawers, cracks and crevices; behind appliances; windowsills and around door frames. It’s worth unscrewing electrical faceplates and puffing DE behind electrical switches and outlets. Cover furniture and mattresses with a fine layer, and work in with your hands. Leave the DE for as long as you can. It might make your house look like it’s been taken over by The Addams Family, but it’s worth it. Hey….It could be great for a Halloween party? DE can kill a bug in 3 hours; it will take some time for the whole population to become exposed and break the breeding cycle. 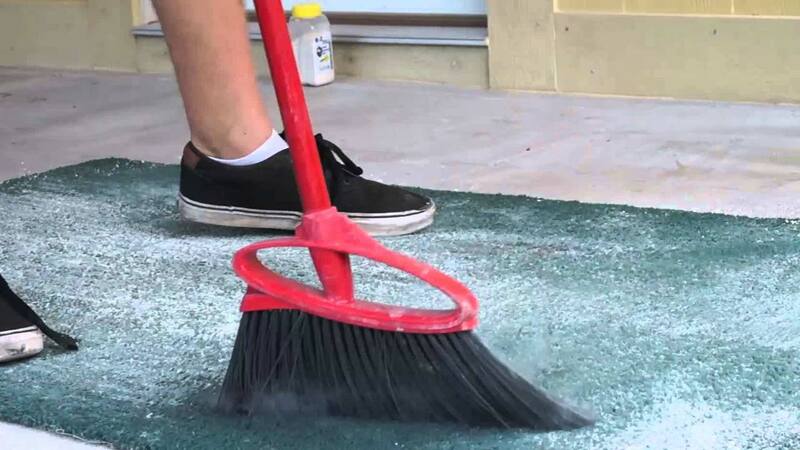 After a couple of weeks follow these tips to effectively clean up your diatomaceous earth. Vacuum up everything you can but don’t use your standard home vacuum (it can damage the motor) – use a HEPA vac or a shop vac. If your bed bugs have managed to survive the shock and awe, try it again. 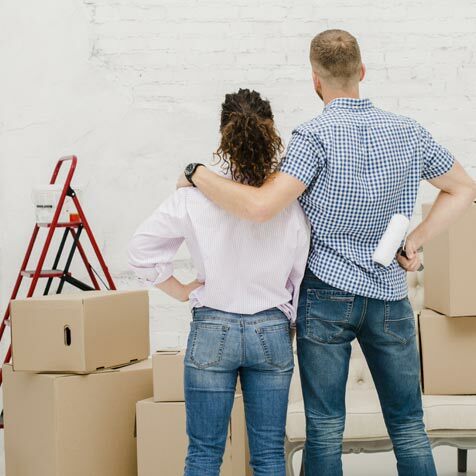 It will work – but you have to break the cycle of infestation. Use the same process for eradicating the home of fleas. If you have pets, the likely source of those fleas is their furry coats. Fleas are a real nuisance for cats and dogs and can quickly infest a home, so preventative treatment is imperative. 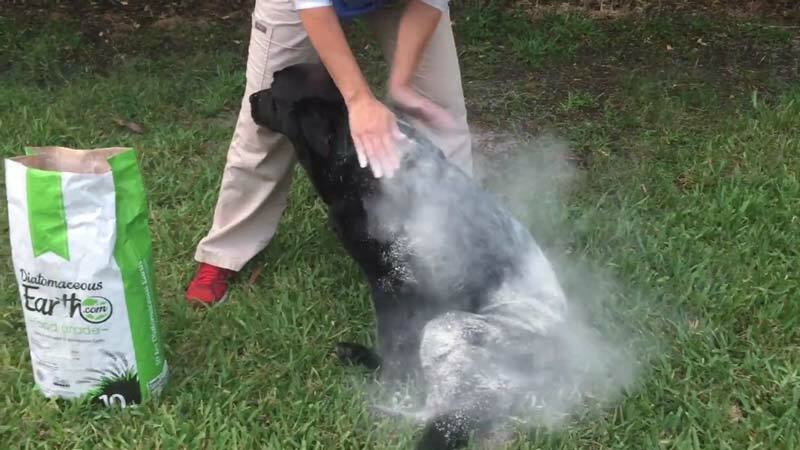 Choose food-grade DE powder for pet protection. Firstly, observe the areas where your pet likes to spend their time – it could be on your bed, in a kennel, on a pillow or a rug. Cats often enjoy sitting high up – mine sits on top of the wardrobe for hours on end. These are the hotspots, where the eggs are likely to be gestating. Vacuum your pet’s favorite hang-outs. After a couple of days of lying around in DE, give your dog a thorough shampooing; which they’re likely to hate, of course, but DE can dry out the skin if left for too long. Once they’re all sweet and dry and fragrant, give them a once-over with a flea comb. Comb them every few days to check for signs of a return. After a couple of weeks, it’s time to vacuum up the DE. The process is the same for cats, but you can miss out the shampooing stage. Have you ever tried keeping a cat still for that long?! Of course, fleas, bugs, and pests start out life in the outdoors and find their way into the home; usually on our furry friends. 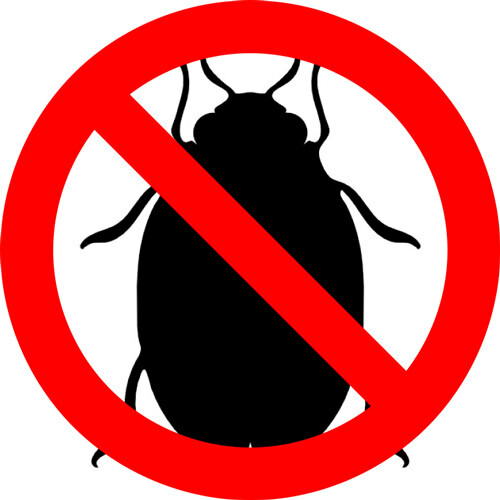 Bearing in mind that DE is also effective on cockroaches and larger pests, application outside of the house can prevent infestation on the inside. Although DE works only when the powder is dry, it can be applied in a wet form; it will only take effect once the powder has dried out. 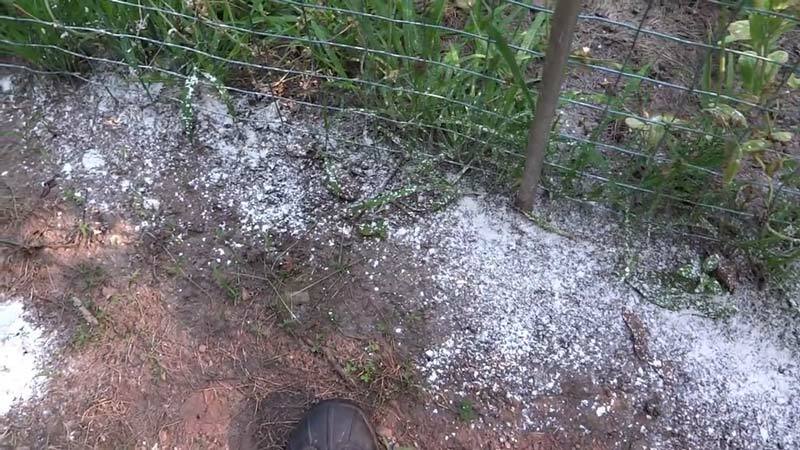 Diatomaceous earth spray is particularly useful outside, especially when applying to areas where a fine layer of dust is likely to blow away. DE is available from Amazon and from most hardware and garden suppliers. 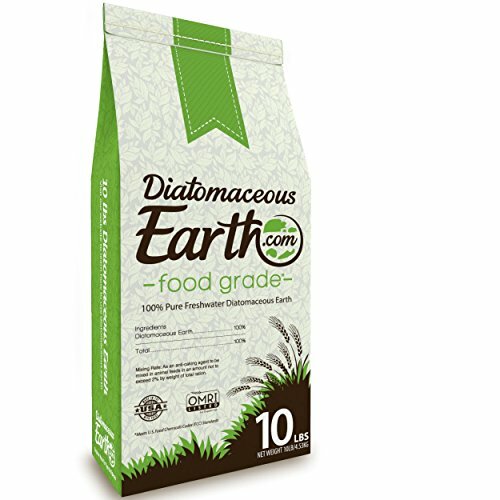 DIATOMACEOUS EARTH YOU CAN TRUST - Our obsession to create the purest food grade diatomaceous earth affects every aspect of our business, from the quality of the deposits we mine from, to the stainless steel equipment that handles the DE. Very informative. I am trying to help my tenants rid the houses of roaches. A friend told me she uses crushed limestone to do the same as you explained. Have you ever heard of DE being used to control Moths? We have a seasonal invasion of Miller moths and they do a good job of squeezing through little nooks to get into the home. I’m wondering if applying this around windows and doors would have an effect on them? Any recomendations on how I should apply it to test this out? Hi Ryan, I’ve heard of it being used to get rid of clothes moths, but not Miller Moths. It might be worth a try if you aren’t having luck with anything else! I would just try the method you mentioned, sprinkle it in any locations that the moths are getting in and see if you notice any improvements. Please do report back on what you find, I’m interested to see if it works! I have several cats and they have earmites. Will diatomaceous earth kill them on the mites that have traveled from the ear canal to their body? Yes, diatomaceous earth should kill earmites as well.